Does your arms and armour collection currently contain daggers and knives? Yes, quite a number of them. Not currently, but I want to add some. I've not added daggers or knives as of yet. Celebrate the Fifth Anniversary of the myArmoury.com Forums! Five years ago today, myArmoury.com launched our discussion forums. Where has the time gone? Man, a lot has happened in five years. This site has grown from its simple beginnings into a strong resource to the online arms and armour community. The forum, its wonderful participants, and the amazing topics found within it have all combined to be a giant part of that resource. The best part is that after five years, we're still going strong! Arms & Armor has donated a brand-new Aunlaz Dagger as a prize for this contest! Please extend your thanks to Arms & Armor and click the banner above to browse their site. You can also read our hands-on review of this dagger right on myArmoury.com. Aunlaz is a term used for a short dagger of English Infantry in the 14th C. The dagger we have depicted here is based on a 14th C, example from the collection of the Royal Armouries in Leeds. 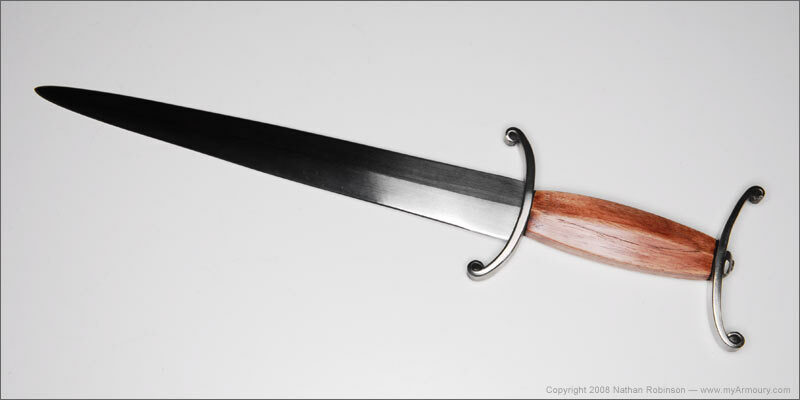 This dagger style is depicted in art and is an example from the early medieval period right through to the 16th C. this is a classic weapon of the medieval soldier. While the original of this dagger is attributed as possibly English in origin by the Royal Armouries, many examples of this style appear in art, from the earliest we have found in the Hrabanus Maurus Monte Cassino, written in the second quarter of the 11th C., and seen in the famous Maciejowski Bible where it is depicted in several of the Battle scenes being employed by soldiers and Knights. This style of fighting knife was popular throughout Europe and the H shaped hilt developed into the famous Holbien daggers of the Renaissance period. 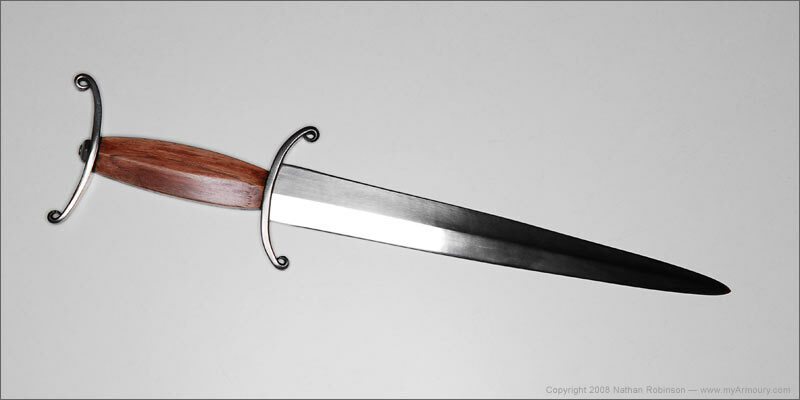 The hilt is crafted with hand formed steel guard and pommel and a stained hard wood grip. You must be entered prior to Monday, September 22, 2008 (start of the day, Monday, midnight PST). All participants will be entered into a drawing and the winning name will be randomly selected soon after. Domestic shipping charges are included with the winning prize, but international winners will be required to pay for shipping. I won't be participating in the contest but I wanted to extend my thanks to A&A for support of the site. It's a beautiful weapon, A&A, and a generous contribution! Very nice indeed; thanks to A&A. I voted in the poll for data's sake; I hope that doesn't interfere with your system Nathan as I am of course not entering the contest. Very nice. A cool but unusual (to my eye) dagger. Thanks to A&A for the prize, and to Nathan and the rest of the team for five years of a great site. I would guess that of all my web traffic over the last five years, that this site accounts for half! I notice, by the way, that my five year member anniversary is this week! I guess I'm participating in the contest because I answered the poll question but since I already have this dagger I will just donate it back should I win it. I really like mine and I think I have the first one that is shown on the A & A site as the wood grain pattern is the same as in the pics. The rear pommel guard can be used in a handshake type grip and is very comfortable this way. The ice pic and hammer grips are really locked in by the guard and " pommel " as is mentioned in the " Review ". Many thanks to A & A for contributing a prize. Congratulations on 5 years! Many thanks to Nathan for realizing and maintaining this wonderful site, this labour of love. And, thanks to all those who support myArmoury. Lastly, thanks to Arms & Armor for donating this fine item in support of myArmoury. Well done! Although I lurk more now than participate, I'm very appreciative of myArmoury, and I'm always glad to visit. Cheers, Nathan! Odd that so much time has passed. Happy 5th Annv. myArmoury ... thanks to A&A.........thanks to Nathan for being such a trooper for keeping this site running. Happy 5th to myArmoury and a thanks to A&A and everyone else who has contributed to make this site the wonderful resource it is. It is a testament of the importance of this site and the quality of it's members that so many are willing to donate items of value to help it grow. You should be proud of what you started, Nathan. Five years - Tempus fugit. Oooo, I really like that dagger. I've been drooling over it for a while, but haven't had the funds to get it. Thanks Craig and the A&A crew for donating this dagger. Very cool. Congratuations on 5 years of bringing the historical weapons community up by several notches, Nathan & crew! Haven't had much chance to participate the past several months, but still enjoy the occasional 'drive-by'. Thanks to Craig for donating such a beautiful piece. Someone will feel very lucky! Appreciate the thought but I won't hold you to it. Oh, I can balance out the " damn BIG sword " with my kite shield or the Mercenary Tailor's heater shield that Allan is customizing for me with a steel cross with fleurs-de-lis terminals and a small steel fleurs-de-lis in each of the 4 quadrants. Oh my, aren't we becoming quite the collector these days, lol. Only one more week until this contest ends and the dagger is given away to its new owner! Hey, the chances to win this one are pretty damn good! There are only 233 entries as of this post. For those who haven't entered this contest, it's easy: just vote in the poll at the top of this topic. You've got about seven (7) hours left!